My house is filled with the smell of sesame oil on a frying pan. I decided to make non-spicy mapo tofu for my kids as my mother recently suggested. She sent me the link to this Cooking with Dog video on YouTube. I remember finding Cooking with Dog about seven years ago when I was looking for sukiyaki and shabu shabu recipes. My husband and I would get hypnotised by the videos and of course develop insatiable appetites for Japanese food. Anyway, I followed my mother’s advice and just used jja-jang paste and left out any hot sauce or spice so all of my kids could eat the dish without any problems. I also vacillated about the meat part which meant that I didn’t think ahead to have any ground pork in the house. I, instead, nicked some of my husband’s diced bacon (Speck) for his weekly Schinken Nudeln recipe and used about 50 grams which added a lot of flavor. I served it with brown rice, and it was an easy meal that seemed to make everyone happy. Next time, I’ll add a vegetable in like diced carrots and/or zucchini. I’m leaving you with this snapshot of our family life since I’m closing up my Korean American kitchen in Germany for a couple of weeks. The parenting adventures will of course continue. No rest for the wicked, as they say. My family and I will be enjoying two weeks of holiday with my parents and my aunt. Since we knew that August would be a month focused on moving and settling in to our new home and city, we decided to have our main holiday for the year over this year’s Easter break. Luckily, my mother took matters into her hands and researched and organised us all to go on a cruise together on the Mediterranean (Sicily, Malta, Greece, Montenegro, Croatia, Venice). We are excited and feel blessed to have a chance to enjoy time with my parents and aunt in beautiful, relaxing and culturally delicious settings. This is our second cruise together with my parents. We cruised through the Norwegian fjords before. It was right after we had moved into our “new” house last year. This time, we are cruising right before the move into our new “new” house. I’ll be back at the end of the month and will have another handful of updates on my writing projects, more crazy kids stories, and another batch of Teutonic-Yankee-Korean culinary escapades. 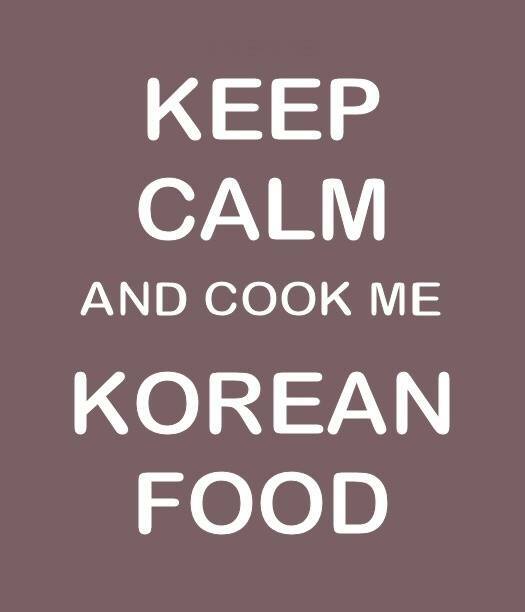 Until then, I’ll leave you with this image which I saw on the Korean American Mommies Facebook page. Having become so ubiquitous, there are few Keep Calm posters which catch my attention anymore, but this one is one that made me stop and smile. Tags: cooking for kids, cooking Korean food in Germany, Cooking with Dog, cruise, Easter holidays, Jane, mapo tofu, moving, non-spicy mapo tofu. Bookmark the permalink.